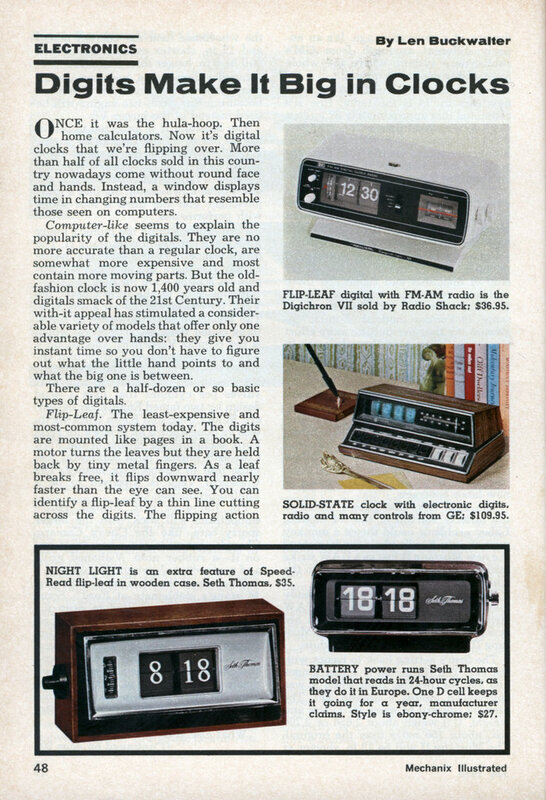 Wow, $109 dollars in 1973 for a crappy digital clock radio. ONCE it was the hula-hoop. Then home calculators. Now it’s digital clocks that we’re flipping over. More than half of all clocks sold in this country nowadays come without round face and hands. Instead, a window displays time in changing numbers that resemble those seen on computers. Computer-like seems to explain the popularity of the digitals. They are no more accurate than a regular clock, are somewhat more expensive and most contain more moving parts. But the old-fashion clock is now 1,400 years old and digitals smack of the 21st Century. Their with-it appeal has stimulated a considerable variety of models that offer only one advantage over hands: they give you instant time so you don’t have to figure out what the little hand points to and what the big one is between. There are a half-dozen or so basic types of digitals. Flip-Leaf. The least-expensive and most-common system today. The digits are mounted like pages in a book. A motor turns the leaves but they are held back by tiny metal fingers. As a leaf breaks free, it flips downward nearly faster than the eye can see. You can identify a flip-leaf by a thin line cutting across the digits. The flipping action produces a faint click that is disturbing to some. Drum Type. This also is found in inexpensive clocks, especially compact models. Here the numerals are on revolving drums, often with one position devoted to seconds (not usually present in the leaf type). Although the drums resemble a car’s odometer, they usually are driven by ratchet action so numbers switch rather than roll. The drum produces slightly less sound than the flip-leaf. Tape. Not long after leaves and drums appeared, manufacturers looked for something better. It led to the development of a tape system. The tape (or film) usually appears in higher-price digitals. It operates with virtually no sound and, perhaps more important, permits better lighting of the digits. Instead of reflecting light from the front, a thin Mylar tape permits light from the rear to shine directly through the digit. 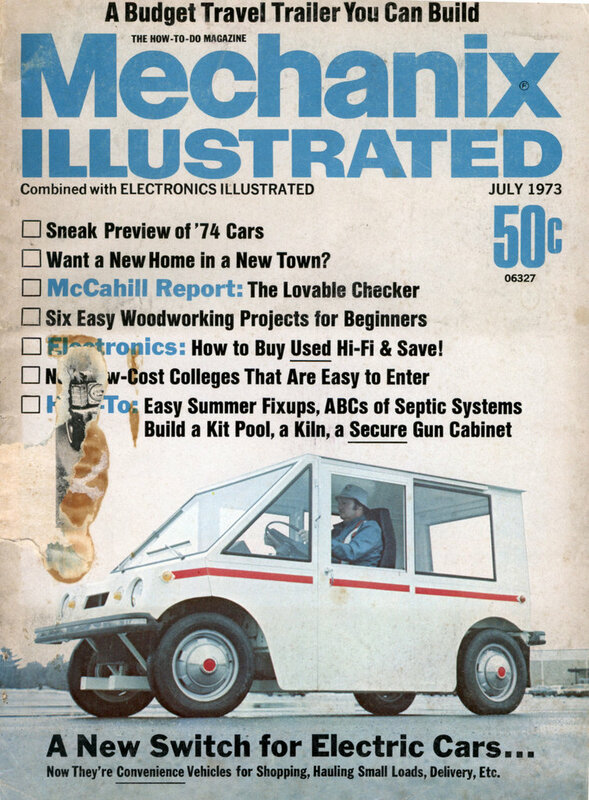 All three of these digitals have certain non-computerish, mechanical qualities. The numbers flashed by a computer aren’t painted or projected but are strokes of glowing light. For example: to change 8 to 0 the horizontal bar in the center simply disappears. Any digit may thus be formed from seven segments. This is the true computer display that clock manufacturers have attempted to achieve in higher-price lines. Electronic Look. On one of these clocks the numerals are not only large (1 in.) but consist of segments which simulate an electronic display. But, unlike the computer, these numbers are created mechanically. A series of horizontal and vertical shutters (driven by a motor) change position and form segments for the numbers. An advantage of the electronic look is that an internal light projects through the shutter openings for a bright, easy-to-read display. True Electronics. The top digital does it like a computer. The giveaway is seven glowing segments for each numeral. As numbers change, there is no sound because the action is purely electronic. A novel feature of electronic models is some form of power-failure provision. One GE electronic digital keeps operating 20 minutes during power failure. It has a built-in battery held on trickle charge. Most digitals have some features to recommend them besides the number bit. These include an attached radio, the usual switches that let you fall asleep and awake to music, and snooze buttons that give you six or seven minutes more sleep. Some newer models offer a friendly chirp instead of a buzzer, others do it with an electronic tone. There is a 24-hour alarm set which means you can reset the alarm as soon as you awaken and not have it go off that evening. Several new digitals double as appliance timers. A new model from Ward’s goes even further. It can control an appliance anywhere in the home, even on another floor. It’s done by a remote-control system which uses the house wires like a wireless intercom. The rising popularity of digitals has spurred a new wave of models. In the coming months expect to see more cordless types for the wall, models with calendar readouts and special mounting styles like RCA’s Cliff Hanger, specially made to be fastened under a kitchen cabinet. What are the designers doing now? The National Bureau of Standards is experimenting with a system that sneaks time signals into a TV broadcast. The information is hidden between frames. Next step, of course, is to use those signals to wind up with the biggest digits of allâ€”as high as your TV screen.